Final Theories. The Structure and Composition of the Cosmos. A black hole must be able to create an explosion, since we otherwise wouldn't exist! The thesis: "The Structure and Composition of the Cosmos" consists of two theories: The Quantum Ether Theory and The Euclidean Cosmos Theory. The Quantum Ether Theory, which is based on the quantum field theory, states that the zero-point field is the background for all quantum phenomena including the propagation of photons and virtual photons, where photons are the basic units of light and other forms of electromagnetic radiation, while the virtual photons are forming the electromagnetic force fields. The zero-point field (also called the vacuum state) is the quantum state with the lowest possible energy. The zero-point field normally contains no physical particles, but consists of transient electromagnetic radiation and particles that pop up and disappear. According to the Quantum Ether Theory, the relativistic physical phenomena such as the length contraction and time dilation occur when solid bodies have a velocity relative to the zero point field, and thereby a velocity relative to the propagation speed of the virtual particles that hold the bodies together. Furthermore, since the traveled length is a function of time, a material length contraction will seemingly give rise to a "time dilation", but the speed of the passing of time has not changed. This means that the time axis is just as linear as the three space coordinates. The clocks may however be wrong because of a length contraction. The experimental basis for such a theory already exists. The existence of the zero-point field has been experimentally verified by the Casimir effect, and according to Maxwell's equations the electromagnetic fields propagate with the constant velocity c = (ε0μ0)−½, which is defined by the electric (ε0) and magnetic (μ0) properties of the zero-point field. 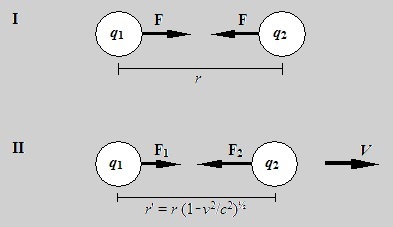 In addition, the length contraction can be derived by means of Coulomb's law, and the Michelson and Morley experiment can be explained by a physical length contraction (see below for an explanation). - The space is Euclidean. - The law of conservation of energy holds good. - No interactions travel faster than the velocity of light in vacuum. - Mass and energy are deflected in a gravitational field. If we compare the theory with the observations of our own Universe, the theory provides an explanation of all the outstanding issues - as for instance dark matter and dark energy. The existence of the zero-point field creates the basis for the theory of the Structure and Composition of the Cosmos. According to the theory, the Cosmos consists of an infinite space where all the matter and energy are collected. When we look at the distribution of the matter and energy, we assume that the Cosmos has existed for an infinitely long time, that the mass and energy is constant, that the space is Euclidean, and that the mass and energy are quantized - and therefore cannot end up as a singularity. The gravitational forces will then produce a mass distribution in the infinite flat space, where the mass and energy assembles into larger and denser structures, until a state of equilibrium arises in the Euclidean space. As time passes by, the larger and denser units will accumulate into black holes and closed universes. Since the quantum theory does not permit singularities, even the closed universes will, as the energy is depleted, end up as giant black holes. However, since we exist there must be a way out. There must be a way in which a black hole can be converted into energy. A black hole may start as a neutron star, or it may as a result of accumulation of matter reach a density where neutrons are generated at its center, such that the interior of the black hole becomes a neutron star. When the external pressure due to accretion of matter gets high enough, the neutrons at the center of the black hole may cross the Tolman-Oppenheimer-Volkoff limit, and thereby undergo a first-order phase transition. Such a phase transition from neutrons to a quark-gluon-plasma result in a collapse of the neutron star and a releases of a galore of energy. Since the difference in mass between a neutron and the resulting two down quarks and the up quark is equal to 1.65 x 10-27 kg, each neutron releases an energy equal to 928 MeV. The splitting of neutrons into quarks and gluons is the largest possible explosion in the universe, since the quarks and gluons only can exist separately under the extreme pressure, which is found inside a black hole. Since the free quarks are not bound together by forces that propagate with the final velocity of light, the quarks can achieve a velocity that make them able to leave the neutron star in the direction of rotation. When the quarks leaves the black hole, the pressure falls drastically during the creation of a quark-gluon-plasma and a galore of subatomic particles such as photons, and leptons. In the initial jet of quarks, photons, and leptons, the temperature will exceed 1012 K. However, during the following expansion the jet will experience a continuous cooling, and after about a microsecond, the temperature may drop so much, that the free quarks and gluons assemble into protons and neutrons, and after some minutes atomic nuclei such as deuterons, and alpha particles may be created. The protons will most likely end up as cosmic rays or as hydrogen in the interstellar medium, while the electromagnetic radiation, if it is not stopped, may reach the farthest regions of the closed Universe before the radiation gradually turns around as cosmic microwave background radiation, which has become red-shifted during its journey through the intergalactic plasma of the closed Universe. Such explosions at the center of the black holes are the largest regenerative processes in the universe, where a regenerative process is defined as a process that transforms heavy elements into lighter ones. This is however not the only regenerative processes in the universe, they may for example also be produced by the merger of black holes, neutron stars, or dwarf stars. And since the regenerative processes get proportionally more active, when the galaxies get larger, there is an upper limit to the size of the galaxies. In this way the regenerative processes deliver energy to the life-cycle of mass and radiation in the universe, where the new energy often ends up as nebulae, from which new stars are born, or as the cosmic microwave background. The gas nebulae are the first step on the road, of stars, giants, white dwarfs, supernovae, neutron stars, and black holes, where the energy once again ends up at the center of the galaxy. As the cosmic microwave background reflects the regenerative processes, it reflects in this way the structure of the universe with the great walls and large voids. The final result is that matter accumulates into universes, where the matter and energy during eons assemble into Great Walls, which mainly consist of galaxies. Each of the galaxies has a black hole at the center where the largest regenerative processes take place, whenever the black hole gets the right size. 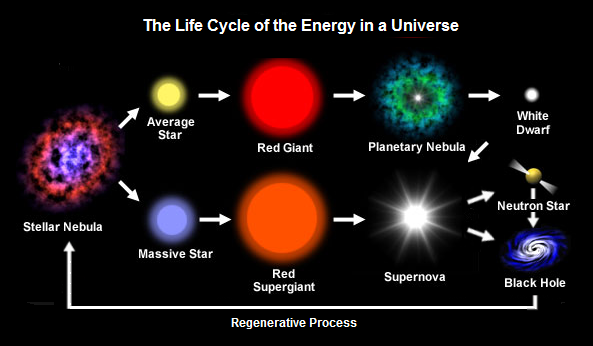 The regenerative processes deliver thereby energy to the life-cycle of mass and energy in the universe, where the new energy may end up as nebulae from which new stars are born, or as cosmic radiation. As the cosmic microwave background reflects the regenerative processes, it reflects in this way the structure of the universe with the great walls and large voids. Finally, since the universe is closed it can be regarded as a black hole, which beyond a certain size, cannot hold on to matter and energy. Since the density of matter and energy in our Universe is estimated to 3 x 10-28 kg/m3, the radius of the closed Universe will be about 1.7 x 1026 m.
The first observation is, that quarks cannot be isolated under normal pressures, but create promptly two new quarks, when they are separated. This means, that the most powerful subnuclear reaction is the splitting of neutrons into quarks, which only is able to generate an Active Galactic Nucleus - but never a Big Bang. The second observation is that light becomes red-shifted when it traverses a sparse hot plasma, as for instance the astrophysical plasma. This means that the red-shift is not a consequence of the expansion of our Universe, so our Universe is almost static. This static state arise as an equilibrium between the spread of matter and energy by stars, supernovae and active galactic nuclei, and the collection of matter and energy by the gravitational force. The Quantum Ether Theory, as described in "The Structure and Composition of the Cosmos”, explains all the physical phenomena that normally are connected with the theory of relativity. Let's look at some of the results. According to the theory the length contractions do not arise because of a velocity relative to another coordinate system, but because of a motion relative to the zero-point field. Consider a solid body. The virtual photons that constitute the electromagnetic forces that hold the atoms together in the body are moving with the constant velocity of light (ε0μ0)−½. 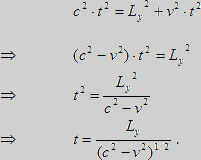 This velocity is defined by the vacuum permittivity (ε0) and the vacuum permeability (μ0) of the zero-point field. When the body moves relative to the zero-point field, the speed of the virtual photons will change in relation to the body. This changes the electromagnetic fields surrounding the atoms. In order to maintain an equilibrium state, the atoms will then have to move relative to each other. This means, that there is a physical explanation of length contractions. Even the relation E = mc2, and the gravitational induced time dilation, can be deduced from the classical laws. The relation implies that the mass is of electromagnetic nature, as m = ε0μ0E ~ ε0μ0eV, whereby it will be possible to submit a TOE (theory of everything), as the primary problem here is, that general relativity and quantum mechanics are impossible to unify. Therefore, the theory provides a platform for answering many of the questions that for the moment seem almost insurmountable. However, Einstein's theory of relativity does not give a physical explanation for the existence of length contractions. In short, a theory, that explains how an observer in one inertial system A perceives the lengths and times in another inertial system B, cannot produce a physical length contraction or time dilation. Such material alterations can only arise because of a physical change of the electromagnetic forces that keep the atoms and molecules together. Therefore, when a news media pronounces that a measurement or experiment confirms special relativity, the result of the measurement is not a consequence of Einstein's relativity, but a result of the physical laws that appear when objects move in relation to the electromagnetic or the gravitational field. 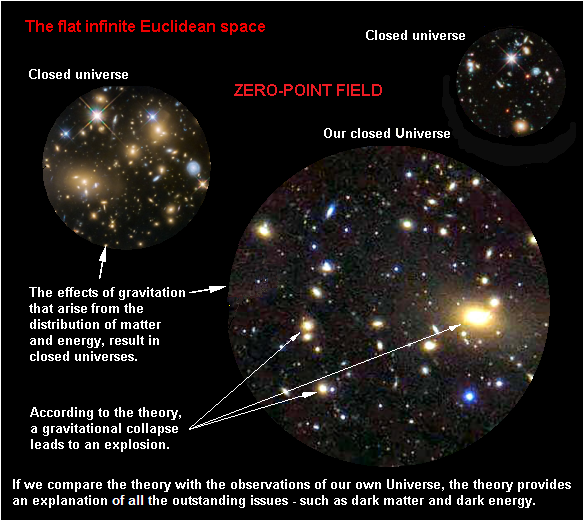 Between the closed universes rests the quantum field with the lowest possible energy, called the zero-point field. If there occasionally in the zero-point field arise a real particle, it will gravitate against one of the closed universes or barren objects. In this way, the zero-point field remains at the lowest possible energy level. 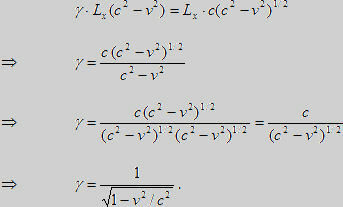 where F is the force, r is the distance between q1 and q2 - and C = 1/(4πε0) is a constant. We assume that the electromagnetic forces propagate in the zero-point field with the speed of light, c. This means that the distance r can be written as ct, where t is the time it takes the forces to move the distance r, i.e. r = ct.
As the forces propagate with the speed of light, c, the distance the force must travel from q1 to q2 becomes to the first order r1 = ct + vt (since the charge q2 moves away from q1). The distance the force must travel from q2 to q1 becomes to the first order r2 = ct - vt (since the charge q1 approaches q2). This is the Lorentz contraction, or the relativistic length contraction, which occurs when a body moves relative to the zero-point field. The time is a measure of the rate of change and can thereby be expressed by how long it takes to move a certain distance, i.e. t = r/v, where t is the time, r the distance, and v the velocity. The Euclidean Cosmos consists of a three-dimensional space and one universal time. However, if the distance becomes shorter because of the speed in relation to the zero-point field, it will obviously take less time to travel the shorter distance. Let us consider a system in motion relative to the zero-point field. Because of the length contraction, the time t' it takes to travel the distance r' = r(1-v2/c2)½ in the moving system will not be as long as the time t it takes to travel the distance r in the stationary system at the same velocity. This corresponds to what in the theory of relativity is called the time dilation. Since the distance becomes shorter in the moving system, the time it takes to travel the distance, at the same speed, becomes correspondingly shorter. As the time is reduced by exactly the same factor as the length, the time will pass just as fast in the moving system as in the stationary system. It means, that the time is the same in the two systems. However, the clocks may because of the length contraction, which depends on their design and orientation relative to the direction of motion, be affected by their velocity relative to the zero-point field. If we choose to look at the space and time as a combined space-time, the time axis will be just as linear as the three coordinate axes. This means that the space is Euclidean, so the gravitational field cannot be explained by the curvature of space-time as in Einstein's general relativity. The Michelson and Morley experiment was an interference experiment, which because of the changing velocities in relation to the luminiferous ether, should have resulted in changing interference patterns, when the experimental setup followed the movements of the earth around the sun - but the experiment showed no changes in the interference patterns. Fíg. The Michelson and Morley experiment. 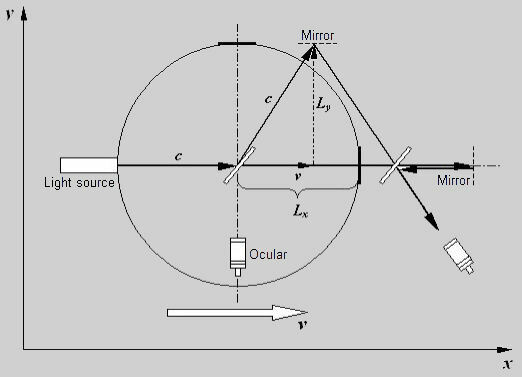 There are two solutions to the Michelson-Morley experiment: 1) The velocity of light must be constant in relation to any experimental setup, and thereby to any object, if it is to explain Michelson-Morley’s experiment. 2) All bodies, which are moving with a velocity relative to the zero-point field, must be subjected to a length contraction in the direction of motion. Einstein chose the first option, which is identical to one of his fundamental postulates: The universality of the speed of light. We will prove that a length contraction of the experimental setup is a solution to the Michelson-Morley experiment. Assume that the apparatus is moving in the x-direction with the velocity v in the zero-point field and that the velocity of light c is constant in relation to this field. When the apparatus is at rest relative to the zero-point field, we have: Lx = Ly = L.
As the experimental setup is moving relative to the virtual photons (the electromagnetic field) that hold the equipment together, the experiment supports a physical explanation of the length contraction. The apparatus consists of atoms that are held together by electromagnetic forces. When the apparatus is in motion relative to the zero-point field, the light and the virtual photons, that constitute the electromagnetic forces, have exactly the same velocity relative to the apparatus. As the apparatus because of its velocity relative to the electromagnetic field shrinks with the factor (1-v2/c2)½ in the direction of motion, there do not arise any changes in the interference pattern, during the motion of the apparatus around the sun. However, if we assume that the velocity of light (c) is constant in relation to any object, independent of the velocity of the object, the length contraction of the object cannot be explained. Because the velocities of the photons, as well as the virtual photons that hold the object together, will always be constant in relation to the object. All bodies that are moving with a velocity relative to the zero-point field, must be subjected to a length contraction in the direction of motion, because of their velocity relative to the propagation speed of the virtual particles that hold the bodies together. Einstein's relativity is wrong. This can be seen from the following separate reasons, where each of them is enough to overturn the theory. 1st: One cannot at the same time have a zero-point field and let all inertial systems be equal. One cannot have a quantum field like the zero-point field, where virtual particles pop up and disappear, and at the same time postulate that all inertial systems are equal. Because an inertial system that has a velocity relative to the zero-point field is different from a system that is stationary relative to this field. This is because the zero-point field is the background in which all quantum mechanical phenomena take place, including the propagation of the virtual photons that constitutes the electromagnetic field. 2nd: Even if the length contractions and time dilations were real according to relativity, it would not be possible to measure any length contractions or time dilations according to the theory of relativity. The theory of relativity is a theory that explains what the lengths and times looks like in a system S' seen from a system S, and conversely, what the lengths and times looks like in a system S seen from a system S'. We assume that when the two inertial systems S and S' are at rest relative to each other, the coordinate values in S and S' have the same physical length, so |x0|=|x0'| at a relative velocity equal to zero. Fig. Two inertial systems S and S', with the relative numerical velocity v.
We now consider the case where S and S' has a relative constant velocity v in the x- and x'-direction. According to the principle of relativity the length of the coordinate x0' seen from S is equal to because of the length contraction, and seen from S' the length of coordinate x0 is, likewise because of the length contraction, equal to . Therefore, according to the theory of relativity, the length contractions "in S' seen from S" and "in S seen from S' " are identical, regardless of whether one or the other or both inertial systems have been subjected to an acceleration or not. Irrespective of whether the length contractions are imaginary or real, it will not be possible to measure any length contractions or time dilations, as the length contractions are identical in the two systems. 3rd: One cannot create a physical length contraction in an inertial system S, just by the mere presence of a moving inertial system S'. As mentioned, the theory of relativity is a theory that explains what the lengths and times looks like in a system S' seen from a system S, and conversely, what the lengths and times looks like in a system S seen from a system S'. If the length contractions and time dilations are fictitious, they cannot explain the real length contractions and time dilations that have been observed! One cannot measure on a fictitious parameter and claim that the result of the measurement is real. If one stands under a lamppost S, and looks at a lamppost S' at the other end of the road, one finds that lamppost S' is contracted. Likewise, if one stands under a lamppost S', and looks at a lamppost S at the other end of the road, one finds that lamppost S is contracted. The length contractions "in S' seen from S", and "in S seen from S' ", are identical and fictitious, but these fictitious length contractions cannot explain the existence of real length contractions. To explain the physical observations it is necessary to assume that the length contractions and time dilations are real. However, if the length contractions are real, it must be possible to create a length contraction in an inertial system S, just by letting another inertial system S' pass by. As this cannot be true, relativity cannot produce any physical length contractions and time dilations. 4th: What physical observations justify Einstein to define: "that the "time" required by light to travel from A to B equals the "time" it requires to travel from B to A", even when the distance AB is moving. Einstein deduced special relativity on the postulations of the constant velocity of light and the principle of relativity. However, during the deduction of special relativity, he suddenly defines a common "time" for A and B.
Einstein defines: "that the "time" required by light to travel from A to B equals the "time" it requires to travel from B to A ". Einstein uses this definition, even when the fixed distance AB is moving relative to the constant velocity of light. In the case where the distance AB is moving, the point B will either approach or distance itself from the point A, during the time it takes the light to travel the distance from A to B, and vice versa, when the light travels the distance from B to A.
Einstein's Relativity says: When I look at you, you shrink, and when you look at me, I shrink, so we both shrink. However, an observation of a moving body does not alter the body; one cannot alter a body just by looking at it. Therefore, Einstein's theory cannot explain the existence of length contractions and time dilatations. There must be a physical reason for a physical change, but Einstein's Relativity does not offer any such reasons! (1) Principle of relativity (Galileo): No experiment can measure the absolute velocity of an observer; the results of any experiment performed by an observer do not depend on his speed relative to other observers who are not involved in the experiment. (2) Universality of the speed of light (Einstein): The speed of light relative to any unaccelerated observer is c = 3 × 108 ms−1, regardless of the motion of the light’s source relative to the observer. Let us be quite clear about this postulate’s meaning: two different unaccelerated observers measuring the speed of the same photon will each find it to be moving at 3 × 108 ms−1 relative to themselves, regardless of their state of motion relative to each other. Stefan Marinov has disproved the principle of relativity by measuring the speed of light in different directions. He found in this way the absolute velocity of the experimental set-up relative to the zero-point field. The principle behind the test is shown in the figure below. the zero-point field to 362 ± 40 km/s. In June 2001, NASA launched a CMB space mission called WMAP (Wilkinson Microwave Anisotropy Probe). From the CMB data, it is seen that our local group of galaxies appears to be moving at 369±0.9 km/s relative to the reference frame of the CMB. This is in accordance with Stefan Marinov's measurement of the velocity of the experimental equipment relative to the zero-point field, which he measured to 362±40 km/s. 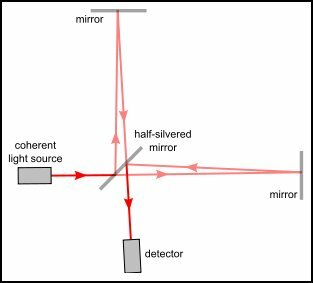 The postulate of the universality of the speed of light was Einstein's attempt to explain the Michelson-Morley experiment. This means that one and the same photon must have the velocity c in every inertial system. However, if the virtual photons that hold the atoms together always have the same velocity c in relation to a body, they will never be able to generate any length contractions. The same photon, e.g. 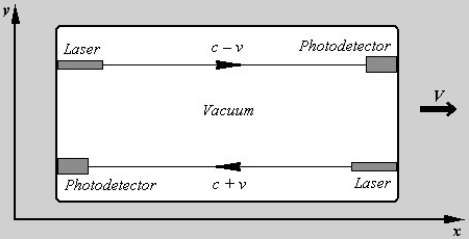 Photon 1, cannot, at one and the same time, have exactly the same velocity c in relation to the zero-point field and the two inertial systems, with two different velocities. Since Einstein's Theory of Relativity is wrong, many of the theories that are based on Einstein's relativity are also wrong. In connection with space it means especially that we can ignore the existence of singularities, and the curvature of space, why space is Euclidean. In order to accept Einstein's relativity, one have to accept, that a definite photon, with mass m = f∙h/c2, has the same velocity c relative to all moving objects, where c is the velocity of light, h is Planck's constant, and f is the frequency of the photon. Stefan Marinov has disproved the principle of relativity by measuring the speed of light in different directions. He found in this way the absolute velocity of the experimental set-up relative to the zero-point field. The Faculty of Science at the University of Copenhagen will not accept the thesis until it has been approval by a third party. Your institute or publishing house, if any, could be that third party! Niels Bohr's Institute has this comment on the relativistic part of the thesis by theoretical particle physicist Poul Henrik Damgaard: The paradoxes of special relativity "can be explained by the necessity of acceleration, to bring two inertial systems into the same inertial system." However, according to the present theory, an inertial system does not care from where it gets its velocity, but it cares about its velocity relative to the zero-point field. This is because the virtual photons that transfer the electromagnetic forces propagate in the zero-point field. Consequently, a body that moves relative to this field will be exposed to a factual length contraction. On the cosmological part of the thesis, professor Jens Hjorth from Niels Bohr's Institute has this comment: "If the work can be published as articles in international journals (with a referee system) it can eventually be accepted for public defense at the faculty." If you agree with the theory or want to publish it, please let me know!